Bradford second row John Bateman and Leeds half-back Stevie Ward are among the players called up for England Academy's summer tour of Australia. Bateman, who at 18 has already made 14 Super League appearances, will captain the side while Ward, also 18, has played four games for the Rhinos. 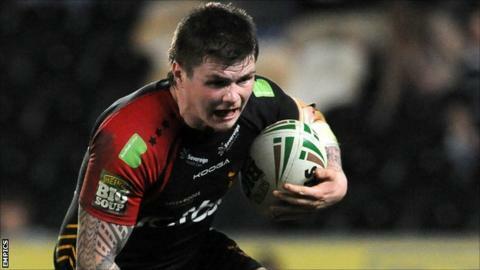 Wigan have six players named, while Ward is one of five from Leeds for the two-Test series departing on 19 July. "It has been very tough choosing the final 24," said coach Dave Elliott. "We've got a lot of talented players at this age group and there are a lot of disappointed players who have missed out on selection." The last time England's young squad recorded a win against Australia was in 2004, when current Canterbury Bulldogs prop James Graham led the side to success down under. "It's a great opportunity and one that many players will never experience - so this is a special opportunity for this group. "We are going there hoping to emulate the success of 2004 and win the series, so the pressure is on us to perform," Elliott continued. "The players have all said that they want to win - they're all very determined to do the shirt proud. "We are under no illusions as to how tough the challenge will be. "We have some very exciting and talented young players in this squad and I'm confident that they'll be able to deliver the results that we want." England will warm up against New South Wales Under-18s and Parramatta Juniors before facing the Australian schoolboys in two fixtures.